It is not every day that you see a 29-foot long, 14-foot tall Chinook salmon hanging out in a field outside of Beavercreek. 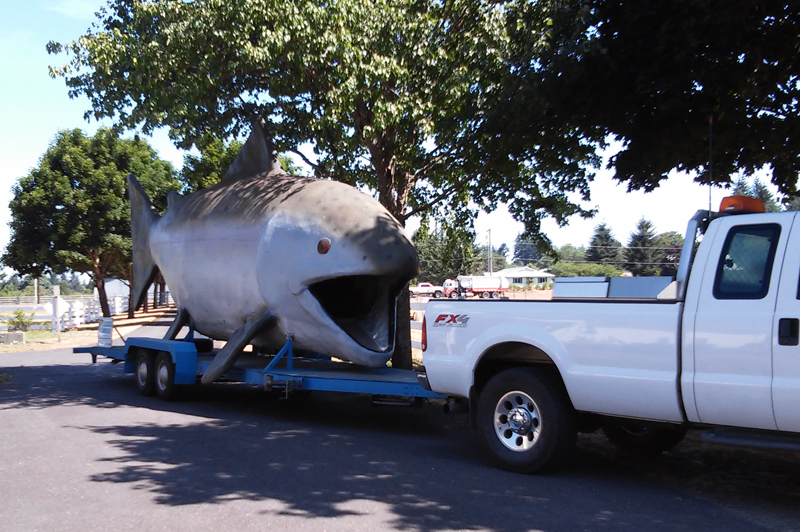 No, it was not an attack by a mutant fish, just Claudia Chinook who arrived in town for Demonstration Day at the Farm! On July 11, 2015, Clackamas Soil and Water Conservation District invited the community to join them at their farm for some good old-fashioned fun! Activities included a demonstration of horse-drawn farm implements by Jessica Lindsay, a local resident. She cut and raked hay with a team of Kiger Mustangs, rescued from Southern Oregon. She was impressive with her training and horsemanship skills! Also on display were some heritage-breed farm animals, including San Clemente Island goats and Ancona Ducks. Kids and adults alike enjoyed exploring inside the belly of Claudia Chinook. More than a few photos of families standing in the mouth of the enormous fish will be showing up on Facebook! Another popular hands-on activity was the native seed-bomb table. Here folks worked compost into a lump of clay, then folded in some native plant seed before forming the whole thing into a ball. When rain falls on the seed ball, the seed germinates and plants grow that will provide food for native pollinators like bees and butterflies. This activity resulted in many smiles and dirty hands, and all had a good time. Farm visitors enjoyed locally made pie and ice cream while listening to the music of “The Other Guys” band. Informational displays and the District’s conservation specialists were also available for those interested in learning about the many ways the District supports our partners and local landowners. Future plans for the District includes more outreach events at the Beavercreek Demonstration Farm. Our farm is located at 22055 S Beavercreek Rd. in beautiful Beavercreek, Oregon!